If you recall, we introduced you to Expert Laser Services last year, as well as its Destroy Your Printer contest. For the past four years, the image solutions provider has invited frustrated office workers to submit videos of them demolishing their printers. A winner was chosen based on votes. While the brand has decided not to continue the contest, the brand wanted to play off of the success of the contest. 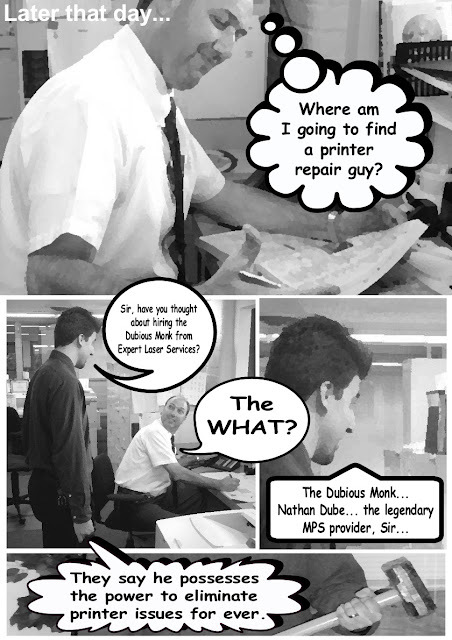 So Nathan Dube, Chief SMM Engineer and MPS Consultant for Expert Laser Services, came up with the idea to create a digital comic around the idea of destroying printers. The brand took an already-successful marketing campaign (the contest) and added on to it. It also helps brand Nathan, who now is a face, not just a name. See the entire comic here.